So you’re planning to visit good old Scotland? Then, you will enjoy reading this guide: here, we’ve included diverse destinations covering the various facets of this country. Whether you want to see the biggest and most modern Scottish cities, explore the postcard-like sceneries up in the mountains or walk around the biggest UNESCO World Heritage sites in the country… this article will give you plenty of interesting ideas. Most tour guides of Scotland focus on the largest cities first, but we feel that an alternate approach is due. After all, first time visitors to Scotland often want to experience its unrivaled natural grandeur and ominous sceneries, more than anything else. If that’s what you’re looking for, then you should consider visiting the Highlands first. Located in the Northwest area of Scotland, the Highlands are a huge tapestry of mountain ranges covering about half of the Kingdom’s area, with a very low population density – think of it as the rugged Scottish wilderness. Here, you’ll find the Cairngorms National Park (the largest in the UK, featuring most of its highest mountains) and more National Scenic Areas than you can throw a hornpipe at. In case you want to explore the Highlands but you’re short on time, maybe it’s best to focus on a (relatively) smaller patch. In that case, we recommend heading out to the Isle of Skye – which is decisively one of the fairest regions in Scotland, from a natural standpoint. A picturesque scene from the Isle of Skye. 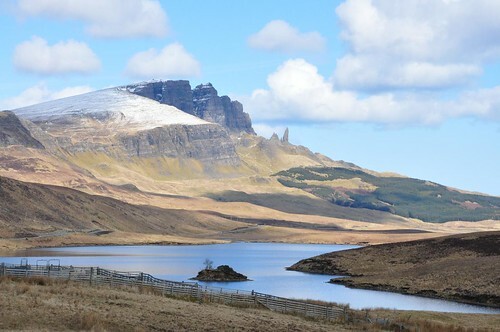 From its exquisite views of The Cuillins, the glorious passage from the main island over Skye Bridge, the monumental castles and idyllic lochs spread all around this dramatically rugged isle… Skye features the kind of landscapes you expect to see, if you’re looking for those breath-taking Scottish sceneries popularized in the movies. On the other hand… if you’d rather get a taste of modern day Scotland, there’s no better place to start than the capital and second most populated city – Edinburgh. Currently one of the leading touristic attractions in the UK, Edinburgh has a long history of arts and culture, as well as a privileged assortment of attractions bearing the UNESCO World Heritage Site designation. A view from the streets of Edinburgh. Coming right from the heart of the city, make sure to check out the Royal Mile for a taste of Edinburgh’s historical charms and its vast selection of museums and galleries. Noteworthy attractions nearby include the World of Illusions / Camera Obscura and the Museum of Scotch (aka Scotch Whisky Experience). A great time to visit Edinburgh is during the month of August, during the annual Edinburgh Festival: a celebration so massive that it often attracts a number of visitors exceeding the local population. And if you want to dive straight into the largest city in Scotland, then Glasgow should be your target destination. Notable attractions worth adding to the must-visit list include the Gallery of Modern art, Kelvingrove Art Gallery and Museum, Loch Katrine aqueduct, Mitchell Library and the Glasgow Science Centre. If you don’t have time to explore the Highlands while visiting Scotland, you can partly make up for it by exploring the wondrous outdoors surrounding Glasgow. It’s advisable to rent a car just so you can leisurely drive around the lovely countryside just outside and around of the metropolitan area. In this written guide, we’ve so far pointed you across two extremes available in Scotland: the wilder outdoors, and the busiest cities. Somewhere in between, you’ll find a multitude of quaint little historical villages and wayward councils that speak volumes of the essence of Scotland as an aged nation. The place to visit if you’re looking to experience the traditional essence of the country is the Scottish Borders, the rural area comprising the eastern uplands. What awaits you there is a chance to experience the traditional side of Scotland, with its majestic castles nestled close to quiet villages frozen in time. Within the Borders, you’ll find some of the best opportunities for rural tourism, with the main highlights being the peaceful contemplation of lush valleys and exploring of scattered monuments. You cannot say you’re completely familiar with Scotland until you’ve been to the Borders! Image Credits: bobfantastic and Moyan_Brenn. Guest Author : This article was brought to you by ukholidayplaces.co.uk, a network of travelers that aims to experience the best the UK has to offer.